LOS ANGELES (AP) Albert Pujols will spend the All-Star break on the disabled list with left knee inflammation, a move that lets the Los Angeles Angels rest their slugger without him missing too many games. 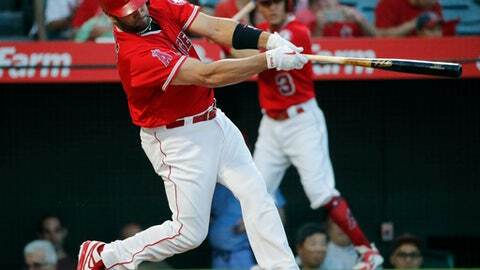 Manager Mike Scioscia said Friday that Pujols had an injection in his knee. Pujols tied Ken Griffey Jr. on the career home run list with his 630th blast on Thursday. Pujols is hitting .252 with 16 homers and 52 RBIs. The Angels and Dodgers meet in the Freeway Series this weekend before the break begins. With the series at Dodger Stadium, there is no designated hitter, and that combined with the break gives Pujols an extended rest. ”It should be improved by the end of the DL time, so we expect him back after that,” Scioscia said.